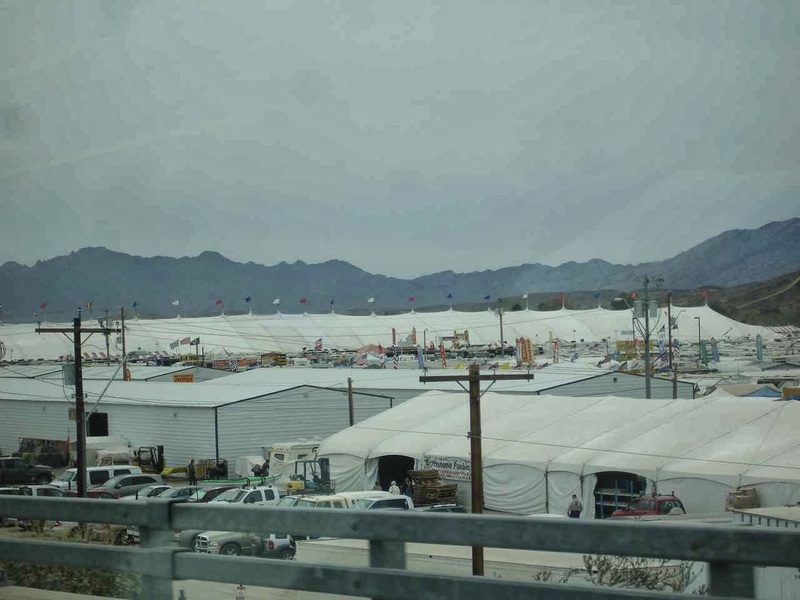 Quartzsite in January usually means the largest gathering of RVers on earth. So says the web page. 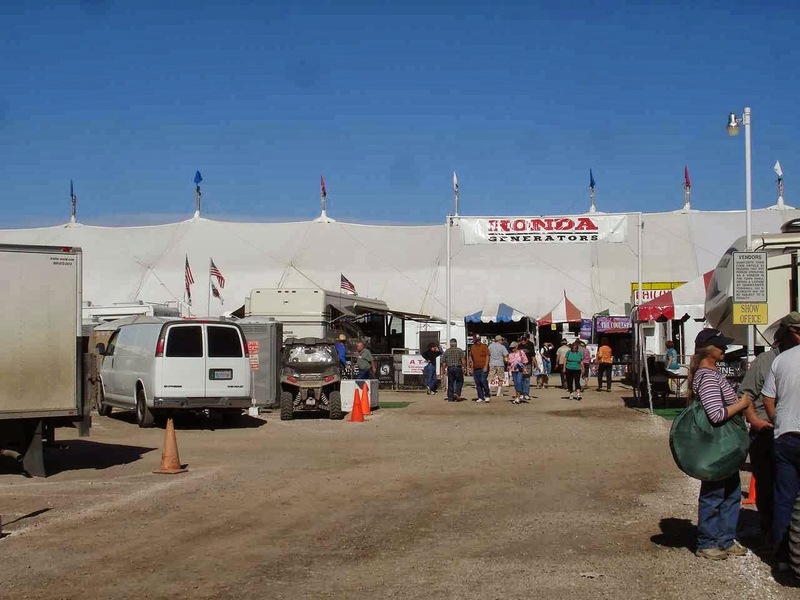 Estimated attendance of 150,000 and set up on 20 plus acres of Quartzsite land. This is just one entrance to the big main tent. 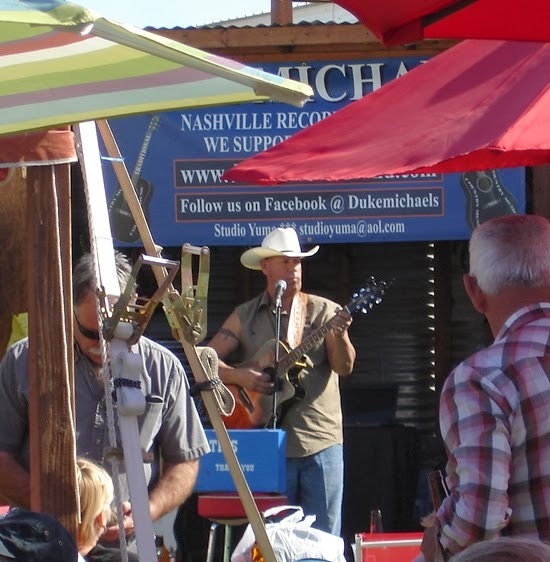 There are similarities to state fairs, except no rides or animal judging or contests. 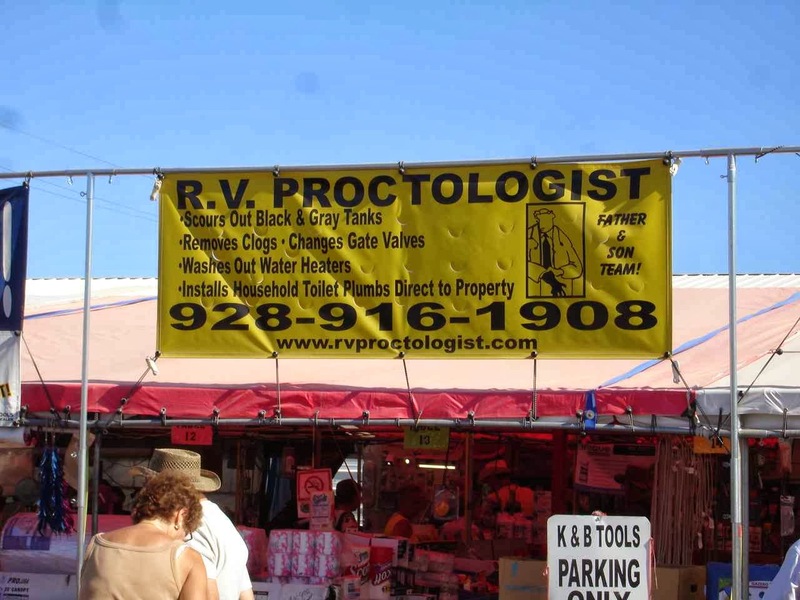 Everything an RVer might want--generators, parts, repairs(big tents set up to change tires or repair or add on stuff). This includes food, clothing, travel(big section for RVing to Alaska), solar, and other improvements to the RVer's life. Stuff you can't do without, according to many of the hawkers. But it is a fun place to walk around. They even have Flo from Progressive Insurance. Note, all of you from New England. The parking fee here in Quartzsite is free. And also the entrance fee to the show and all vendors is also free!!! 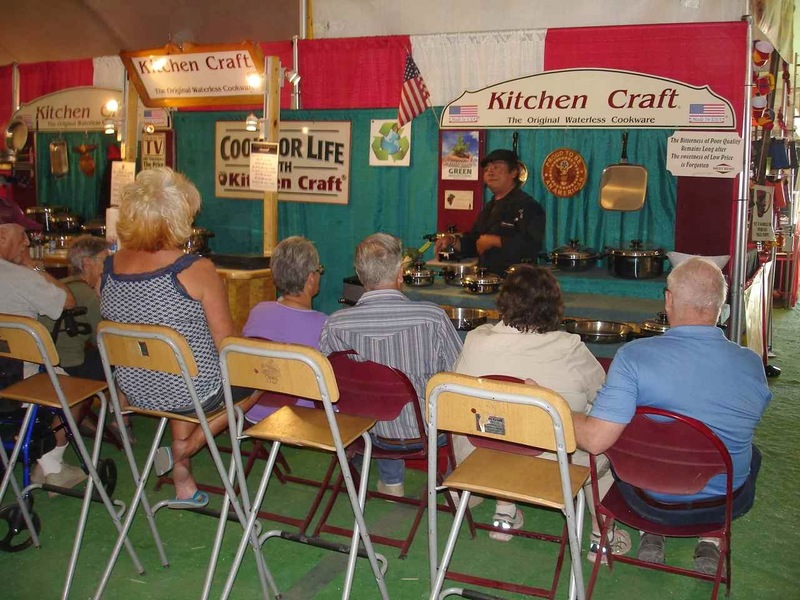 All kinds of kitchenware for your RV. Even cooking shows, like this one that usually had a very attentive---and hungry---audience. 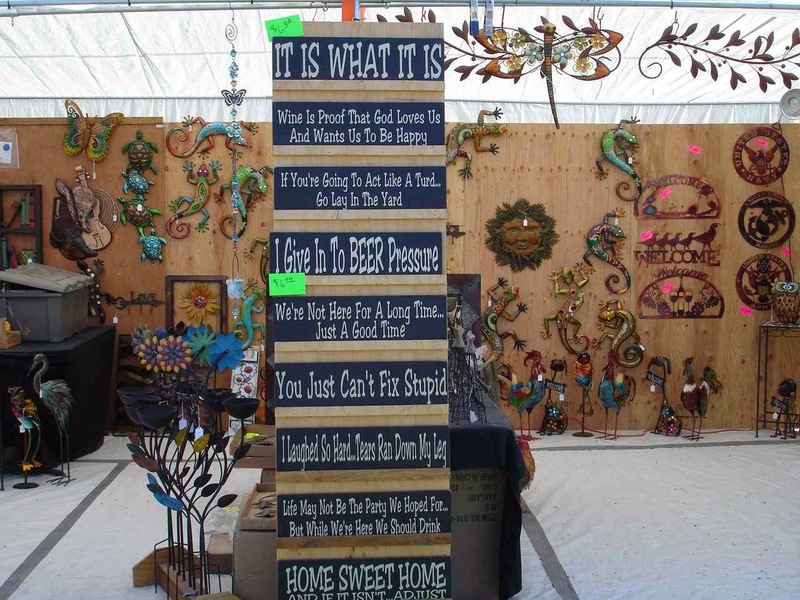 Outside the main tent---and all over Quartzsite--were smaller tents selling all kinds of things. 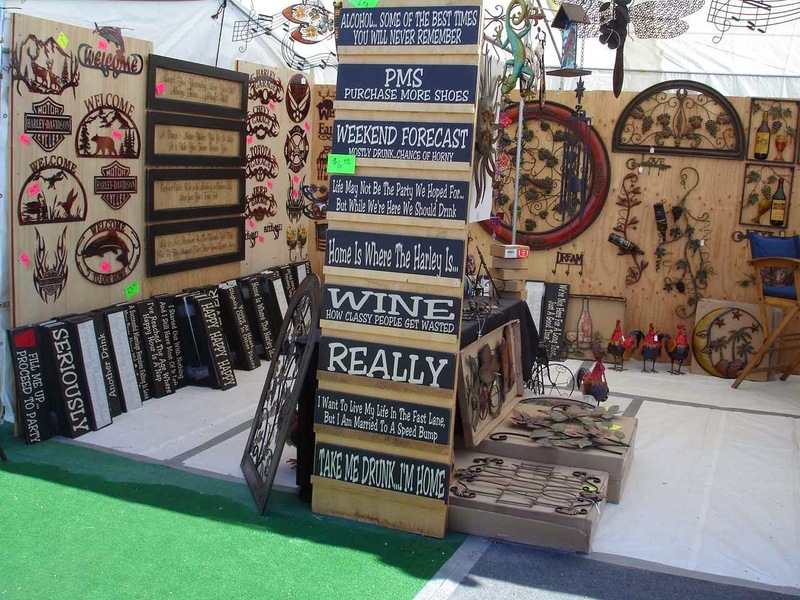 These signs seemed to feature more offcolor sentiments. "ouch" but it might also get you inside to see what they offer in the not-so-humorous line of plumbing. In the area of the large tent are also some permanent looking tent displays of rocks and gems. 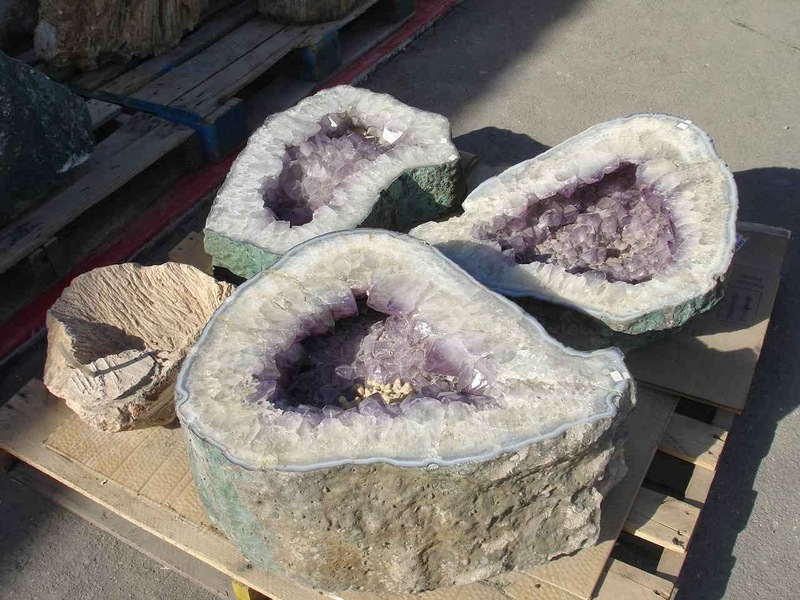 You can judge by the size of the normal pallet they are on, how large these geodes are. 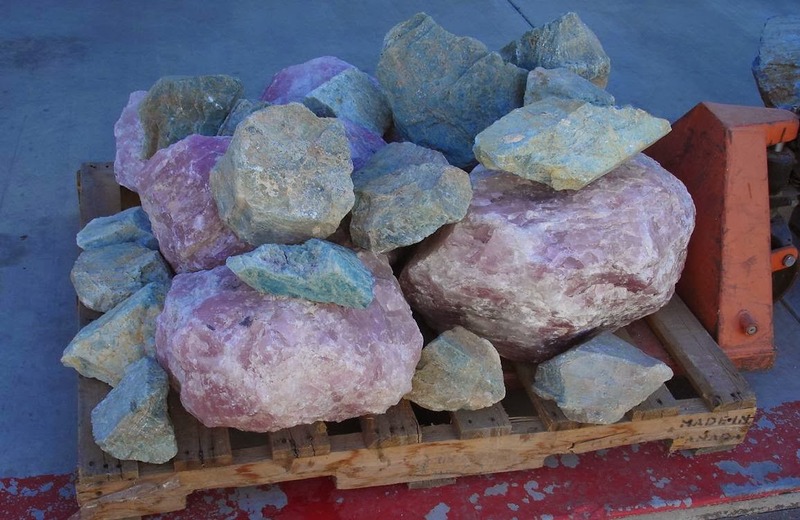 Some of these boulders have wonderful color, even before they are cut or polished. Other stores have large--sometime 4 or 5 feet across--polished colorful rock slices. And, of course, many, many examples of small to large jewelry sized turquoise and other gems. Outside the main tent, in the area, and around town, are all kinds of eating stops. I thought this one was rather appropriate. Especially like the little addition at the lower right hand corner. Jan laughed at this too. Sort of what you might expect from an outdoor bar. 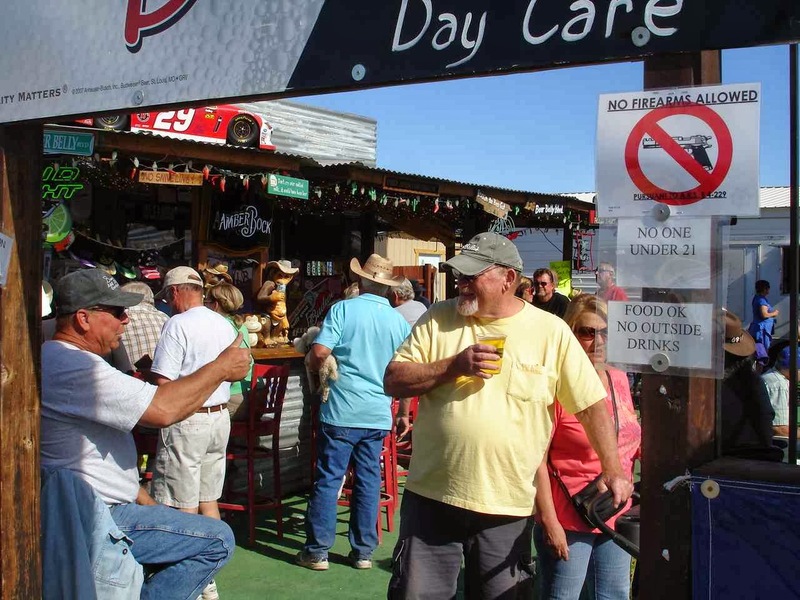 Lots of tables, a good selection at the bar, and plenty of cowboy hats and others. SO----what was not allowed( see small red circle)? Good thing. One note to make. If you take a survey of full and part time RVers , you will probably find that most of them are carrying firearms in their RVs. Some have normal and concealed permits for firearms. 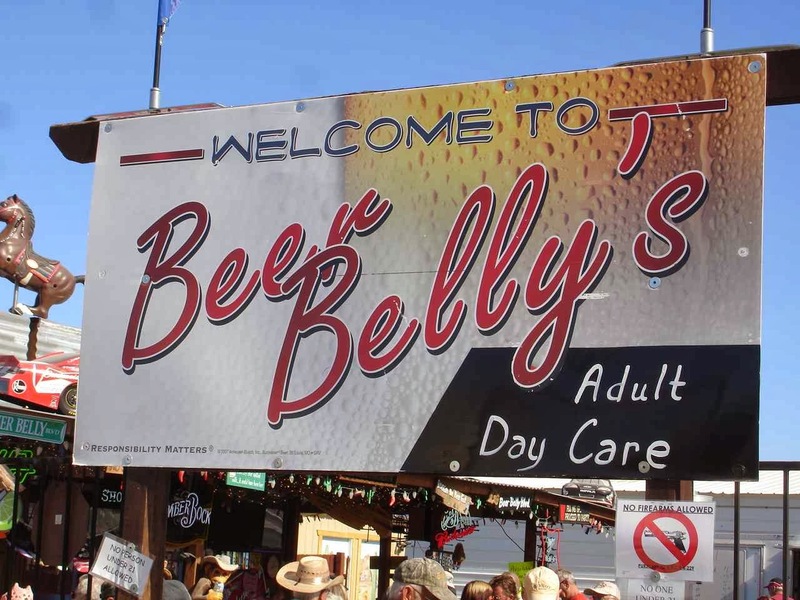 One of the main reasons for Beer Belly's popularity was some good performers such as this one. Did not recognize the name, but his big banner is indicating talent from Nashville. That might not mean a lot--depending on the talent. But this gentlemen was quite enjoyable. This was our choice today. 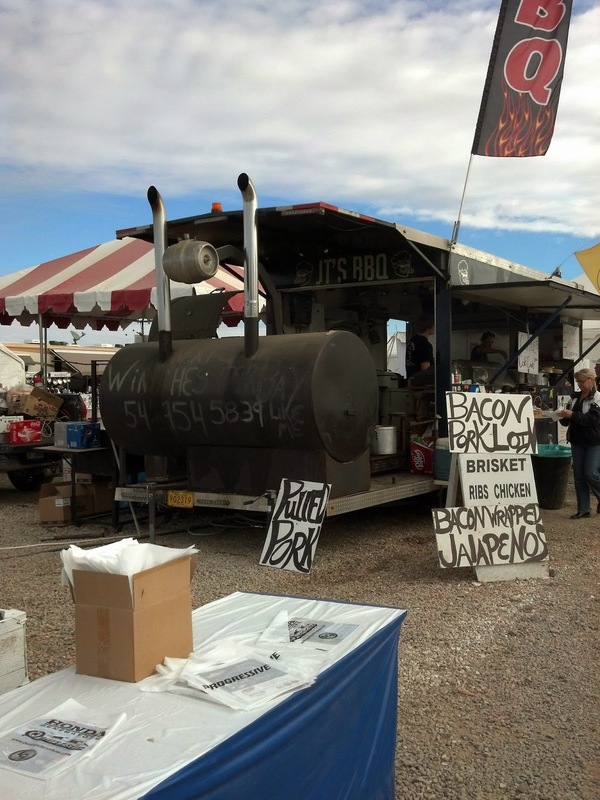 We had stopped at another BBQ the other day --away from the tent. Quite good. This one, just outside the tent entrance was also very, very good. Note the size of the smoker/grill. Got to love the large truck exhaust pipes on top of what looks like an industrial sized oil tank. Needless to say, they were quite popular--especially with the vendors who had been working here all week. 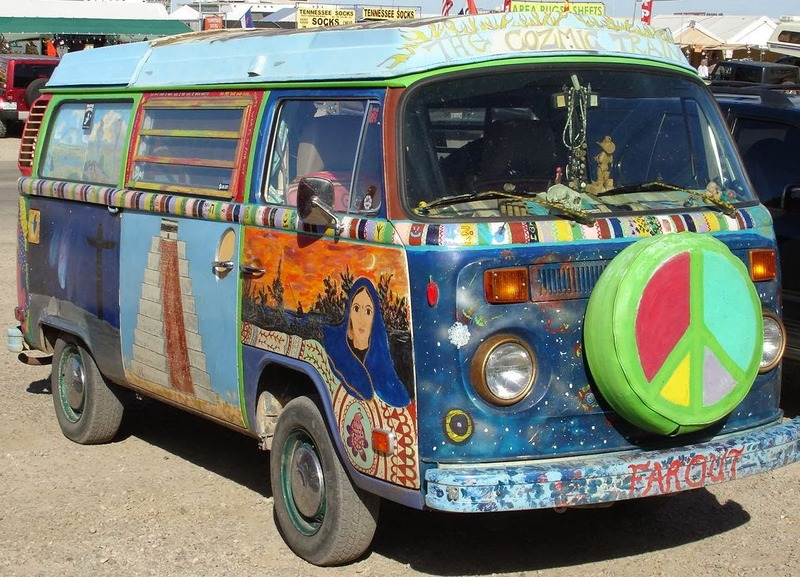 You don't have to look very far at Quartzsite for unusual vehicles. Tons of ATV's rushing over the local hills and mountains and dirt roads. Also unusual vehicles like this old VW camper. Not sure of the year. Looks like 60's designs, but the camper might be from the 70's??? 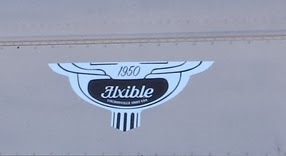 Flxible Bus is dated from 1950. Hint----these are the shape buses that we used to travel on for trips when we were in junior and senior high school. And no----they were not old then. From the side of the bus Flxible 1950. Everything looks good. Tires, paint, and body are in good shape. Note- the mirrors are of a newer and larger size. Also, the 2 air conditioners on the roof are of a new design. Would loved to have seen the inside.